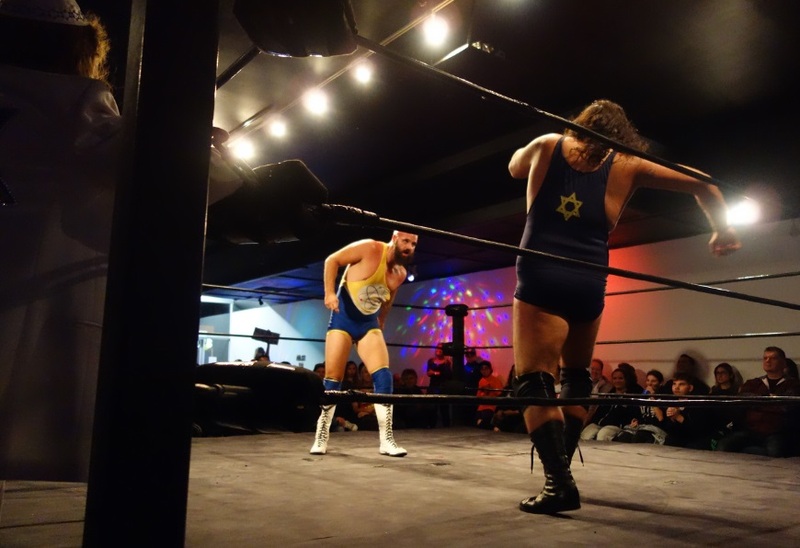 The sport of wrestling is alive and thriving in Canada as embodied by a colourful roster of athletes at Hogtown Live Wrestling in Toronto. 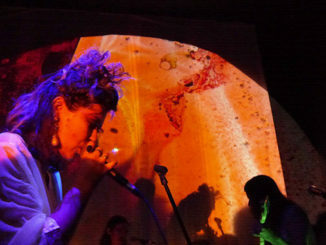 Hosted in open spaces, empty nightclubs and different music halls each month, the October 1st Socktoberfest show was held at The Super Wonder Gallery on Bloor. This nomadic wrestling club’s events feature a dozen or more performers squaring off in six or more separate bouts, each as thrilling as they are unpredictable. The realistic looking combat entertains people of all ages, and the storytelling impacts the audience and makes each match very memorable. History was made at this show. 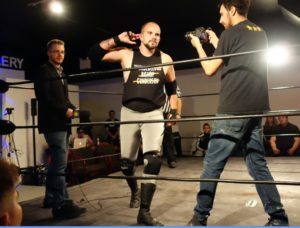 It marks the debut of Hogtown Wrestling from the ashes of Victory Commonwealth Wrestling and the start of Season Five of their wrestling television series on Rogers TV. The printed banners and event signage donated by Sign Source Solution was the very first topic on conversation when the wrestling league administrators stepped into the ring to welcome the audience. 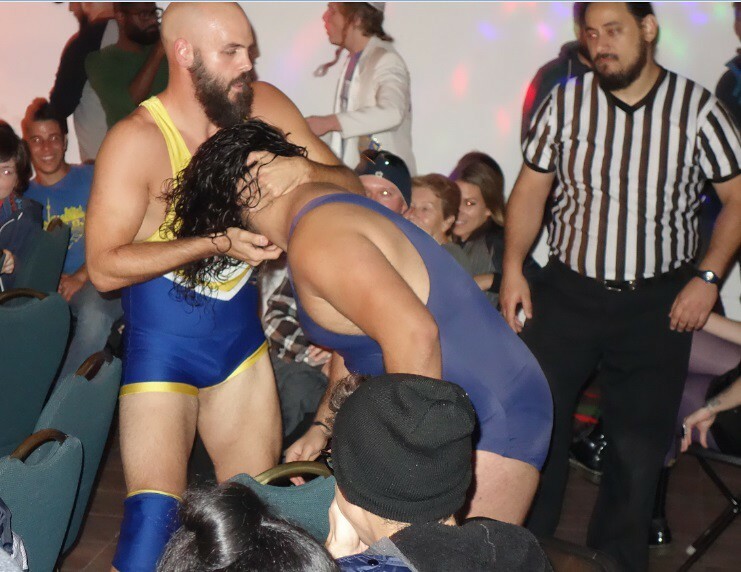 Wrestling events generally have the performers spewing some vengeful dialogue before the physical spectacle begins, and the Hogtown club is no exception. The Wrestlers strut about in the ring and make their emotions clear and their intentions very well known in boastful or belligerent statements before their challengers arrive. In this way the crowd can more confidently cheer them, or boo them down when they win or lose, because they feel they know the whole story. 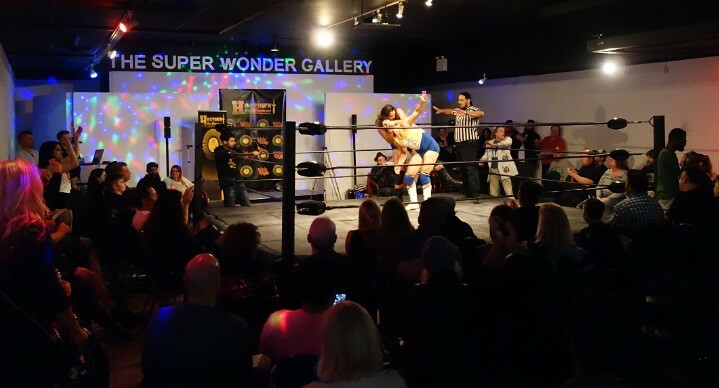 The character driven stories make each athlete’s encounters more interesting; its a soap opera in a wrestling ring and audiences crave stories that mix human emotion with physical skill.On that night, the large art gallery played host to one hundred spectators not including the wrestler’s friends and female companions. Some local businesses have come on board as proud sponsors. Here’s Frankie from Amico’s Pizza Toronto who was one of the sponsors of Socktoberfest, posing with the Ring Girl, Raymi the Minx. Raymi was there working at the Hogtown Wrestling Event as the official Ring Girl, a gig she takes seriously as she reports in her blogs. 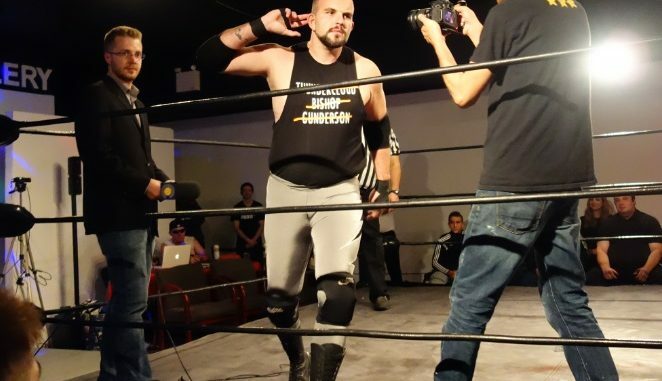 The Hogtown Pro wrestlers themselves are a loose assembly of athletes collected from all walks of life – some are body builders and personal trainers, and a couple came from the ranks of the Canadian Armed Forces. But mostly they’re civilians, aspiring actors and stunt doubles who lead otherwise normal lives. Two of the biggest stars in the ensemble work together as building contractors every day and three others are heavy equipment operators at the same Toronto area paving company. Most of the Hogtown Wrestling roster have day jobs that let them regularly exercise their muscles and keep fit. 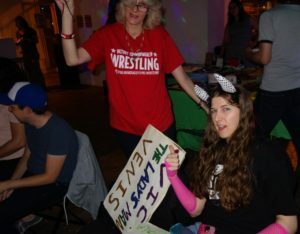 The Super Fans in the audience help refine the wrestlers’ evolving personas – they sometimes add to the myth-making by spontaneously chanting a four beat catchphrase like ‘lo-cal he-ro’, or ‘eat a piz-za’ with an emphasis on each syllable. These magic moments where the whole audience gets involved are flushed out more in the storytelling that occurs after the show on Roger’s TV, and in derivative blogs and articles. The catch phrases conceived by a couple rowdy fans in one match, and echoed by the crowd and commentators that evening, will very often make its way back into the act in a more substantial way at the performer’s next appearance. It could be crystallized as a temporary or permanent piece of flair, a colourful prop or slogan on their costume or that of their manager. A good example of a successful gimmick, The Hacker’s broken glasses are an intriguing piece of personal flair. 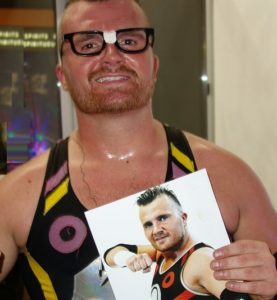 This wrestler wears them when he appears at the front of the venue to sign autographs on his 8×11 photos after each match. The Hacker has legions of devoted young fans who want to emulate their hero in every respect. The broken glasses props are on sale for $4 ea and Mom (seen watching in the background) was only too happy to buy them for her boys. These youngsters were chronicled in Dumpdiggers blog post about collectible Toronto Wrestling Posters, which details these story accessories and other kitsch while making the argument that buying local wrestler’s memorabilia is like making a small bet on their eventual stardom. So this local sporting events has that dimension too; there are people out there archiving all this activity for posterity (and their own profit). The wrestlers of course love being chronicled and collected. They are very much focused (obsessed) with their careers, and have each developed their characters’ backstories over dozens of matches, and formed loose alliances with each other either in their struggle to climb to the top and win a Title Fight. They each want to be recognized as The Champ. The Titleholder’s trophy is a gold and silver metal buckle patched two ply thick leather wrestling belt. The Ring Girl removes the belt from The Champ just before he steps into the ring for the final match with The Challenger. Here are a few glimpses of the Title Match at Socktoberfest on Saturday 01 Oct 2016. 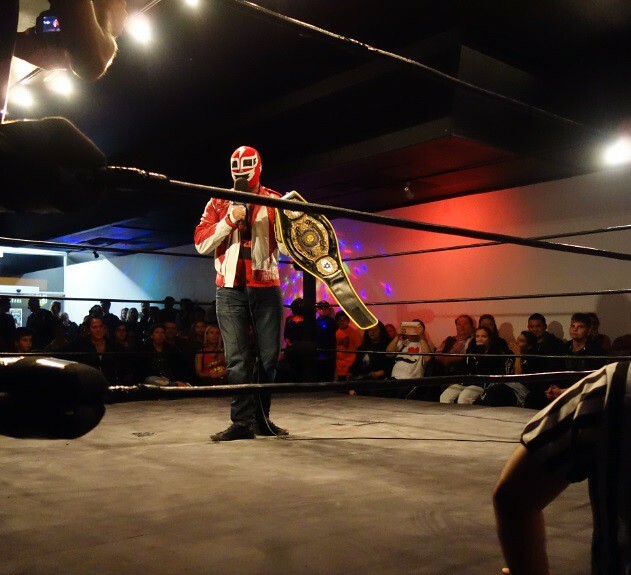 On that evening the main event was set to decide who would become the new Champion of the Hogtown Wrestling league. Below we see challenger Jim Nye the Science Guy (in yellow and blue) get champion Goliath Ayala (in blue with the Star of David on his back) in a crippling headlock. Both wrestlers have a large fan base and these rival factions would shout (playfully) at the wrestlers and each other during the match. The live wrestling action in this league knows no boundaries! The combat frequently spills out into the crowd. At one point during the Title Match on Saturday night, the wrestlers fought one another among the chairs in the gallery as the audience scrambled to accommodate the melee. Goliath pushes Jim Nye outside into the street! The ruckus went the whole length of the auditorium and even went outside the venue! Goliath pushed Jim Nye out the front door and right out into the street. And for three and a half minutes (which seemed like an eternity for the audience inside, including the Rogers TV show announcers) the two big men grappled on the concrete to the amazement of pedestrians, until Jim Nye got free and ran back inside the venue. The man you see on the right (in the picture on left) worked for the gallery and made sure nobody got in the way of the performers as they fought in the entrance. This author tried to advance to snap a shot of the spectators outside marveling at the spontaneous sidewalk show, but was prevented from leaving the hall and unceremoniously pushed clear of the door for my own safety. It was smart thinking on his part; moments later the wrestlers came barreling back into the room. 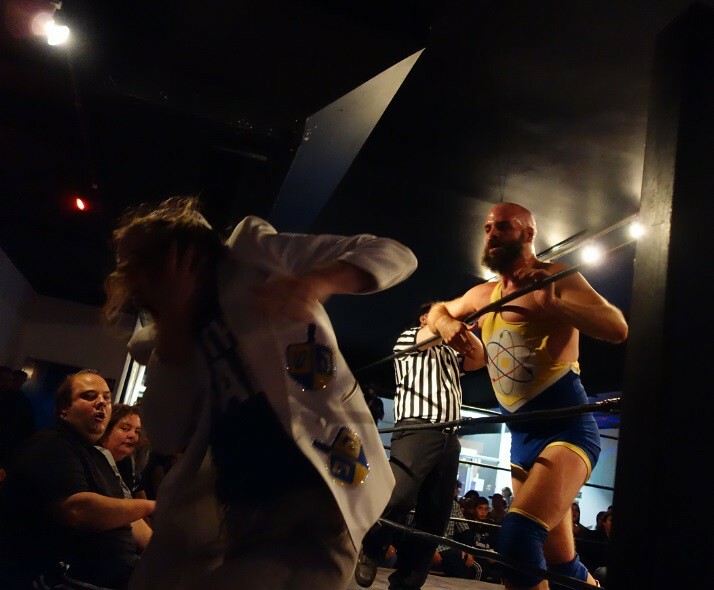 Elbowed in the face, Science guy crippled Goliath’s manager; non combatants frequently interfere and are just as often attacked and ‘knocked out’ at these shows. After many punishing blows and counter attacks a winner emerged to be recognized as the new titleholder. 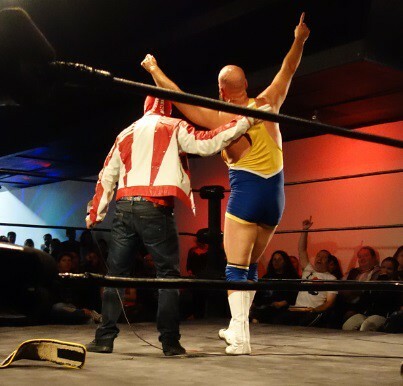 At the end of Socktoberfest, Jim Nye the Science Guy defeated Goliath Ayala and so he’s now the Hogtown Pro Champion. That means he gets the belt until another wrestler defeats him. Wild Machine helps Jim Nye collect applause! This last match wasn’t so much about an athlete in yellow challenging and defeating a more well known athlete in blue, but rather, it was a story about how a man of science can best a monster that depends only on his brute strength. Much like how David defeated Goliath, the smarter wrestler in yellow paced himself until finally overcoming the exhausted blue bully after an epic twenty minute struggle. On that level, it was a courageous win; and the victory was legendary. At the end of the night, a mysterious masked wrestler who calls himself the Wild Machine became the focus of everyone’s curiosity. This (new?) character is central to the upcoming Nov 11th 2016 event. This author has seen his picture on at least one of the posters (in the poster art) debuted by Mathew Brady the President of Hogtown Wrestling league. 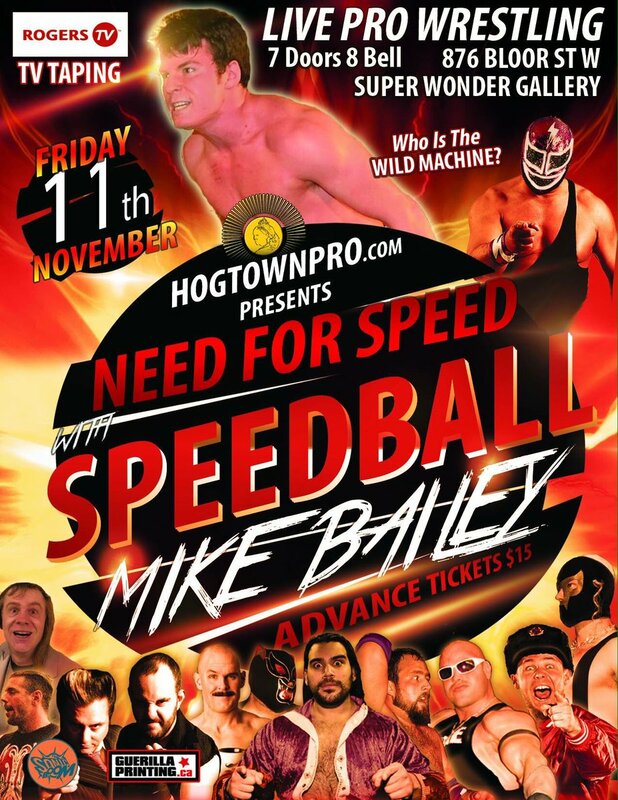 Hogtown Wrestling is an amazing spectacle set in the action packed world of pro wrestling and filled with colourful characters performing sports theatre complete with amazing stunts and tongue-in-cheek humour as their thought provoking combats tests men and ideas. Be sure to check out the Hogtown Live Wrestling in Toronto website for more info.